This document explains how to find the computer name on a University owned Macintosh Computer. 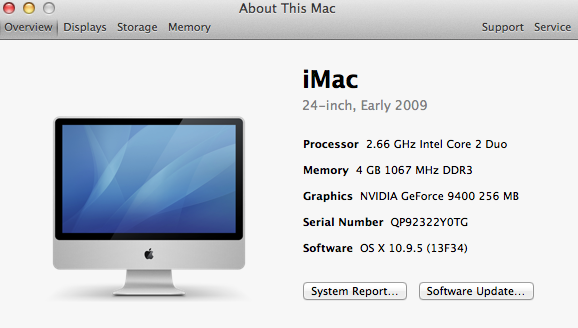 If your Mac does not boot, you can instead provide your IT support staff with the serial number of your Mac. At the login screen, click the Clock in the upper-right hand corner. Additional information will be displayed to the left of the clock. Clicking will cycle through the OSX version number, IP address, and computer name. The Computer Name may also be found in About This Mac. These instructions apply to both Mac OSX 10.9 and macOS 10.10 and above. 2. Click on 'About This Mac'. 3. If the computer is using OS X 10.9 or below, click on 'More Info...' If the computer is using macOS 10.10 or higher, proceed to step 4. The computer name will be at the bottom of the System Report screen, next to a miniature icon of the computer they are using. The computer name is on a light-blue background at the bottom of the window.